Prius have two cooling systems: one for the engine and one for the high voltage inverter. 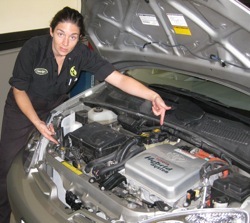 They have two separate fill points (see pic: Carolyn’s left hand is pointing to the inverter reservoir, right to the radiator cap). Technicians failing to fill both systems will cause overheating to whichever system is neglected (illuminating the Master Warning Light (red triangle) and the “check engine” light). I’ve seen this so many times that I’m starting to get angry!!! I mean, if you don’t know (or can’t figure out) that the car has two cooling systems, you have no business working on it!!!! To be fair, inverter cooling systems are predisposed to another problem (besides unqualified techs) of failing water pumps. 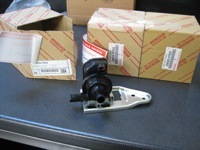 Gen 2 inverter water pump issues have been discussed previously: Prius Code P0A93: Inverter Water Pump Failure. But 2001, 2002, and 2003 Prius have the same problem. At the moment we have three Gen 1 Prius here with inverter cooling issues (with P3130 stored), to which I dedicate this blog. 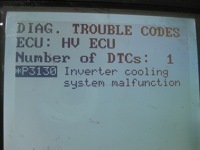 When Gen 1 Prius inverters overheat, they set a trouble code P3130: Inverter Cooling System malfunction. The next step is to pop the hood and look at the reservoir. Does it have coolant? If not, there is problem #1. Of the three cars here, one was simply left unfilled (system overlooked); the second had the drain plug left loose and consequently lost all its coolant down the road (see pic of dried coolant trail). 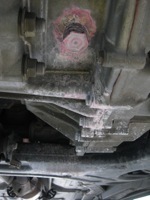 If the car has coolant, the next question is whether it’s flowing. Remove the cap on the inverter reservoir (the one ATTACHED to the inverter) and look for turbulence. No turbulence? The car either has air in the system or the pump is stopped. Find the pump (hint: it’s behind the driver’s headlamp assembly) and put your hand on it. Is it vibrating? Then there’s probably air in the system prohibiting coolant flow. (In this case the pump should also be noisy; you can massage the hoses to work the air out of the system; when it’s quiet and you confirm turbulence in the reservoir, you’re done.) It is possible that the motor is running but the impeller has broken free, in the case that you have vibration but no noise and no turbulence. I have never seen this, but it’s possible. Let common sense guide you. No vibration? Check the power and ground to the pump, at the connector. I use a noid light; when it illuminates I know the pump is bad; otherwise troubleshoot the circuit. Of the three cars here, one has a seized pump (it just went bad on its own, which is common); the one with the missing coolant was also disconnected from power (I will have to check it once I fill the system) with the pump actually tucked under the inverter (!) so it appeared to be missing; the third one—with the loose drain plug—has a powered pump that’s now seized from being run without any coolant in the system (which also cools the motor and probably lubricates it too).